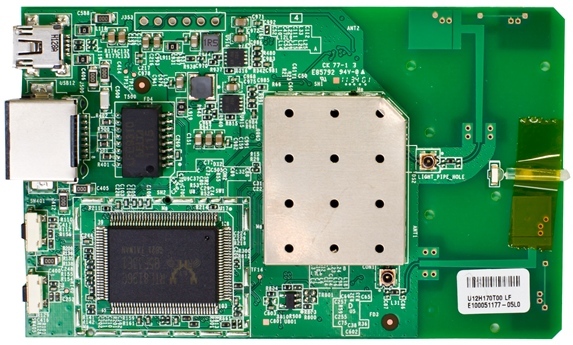 Recently we have published a review of ASUS EA-N66 wireless network adapter that allows connecting the devices with only wired interface to wireless networks. 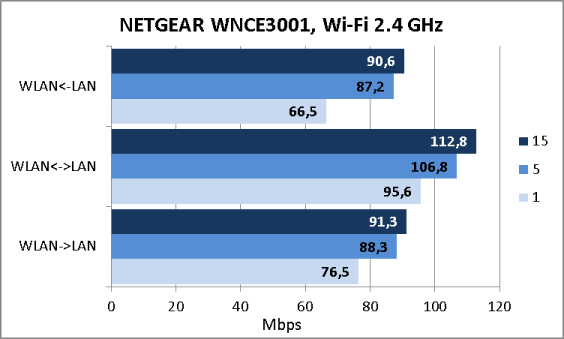 Today we would like our readers to get familiar with another inexpensive wireless network adapter of 802.11n standard – NETGEAR WNCE3001. Though the model WNCE3001 appeared much earlier than its ASUS analogue, we decided to introduce its review only now. 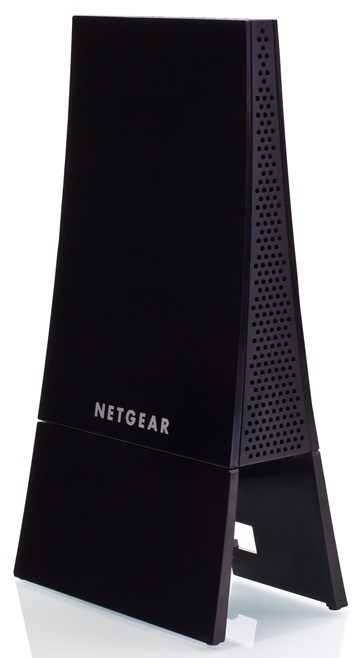 Wireless adapter NETGEAR WNCE3001 half-face resembles the Eiffel Tower, on its sides there is the perforated vent grate. The front and the rear surfaces are glossy and there is the vendor’s name as well as a sticker with the device brief information is placed. The upper narrow panel is also a perforated vent plastic grate behind which a LED showing the device status and the wireless transmission mode is hidden. At the bottom of the adapter there is a shallow stand with a technological hole for cables and Ethernet connection at WNCE3001 placement on a table. Unfortunately, because of the little device weigh using thick wires can bring to WNCE3001 capsizing on the table. Also it must be mentioned that this wireless adapter can be hung on the wall thanks to the special sticker which is given in the kit. The device bottom itself is perforated too and has two ports: Fast Ethernet and USB (for power supply only). Besides, there are the buttons Reset and WPS which roles are standard. 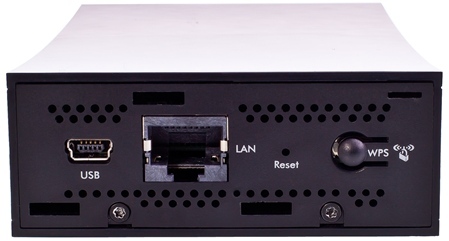 WNCE3001 power supply is provided either by a special adapter through the alternating current network or by USB connection to the final cross point. Now let’s look inside. The electronic filling of WNCE3001 consists of one green textolite board with the main elements on both sides. The wireless part is hidden behind the removable metal screen and in fact it is a Realtek RTL8192DR chip supporting IEEE802.11b/g/n. 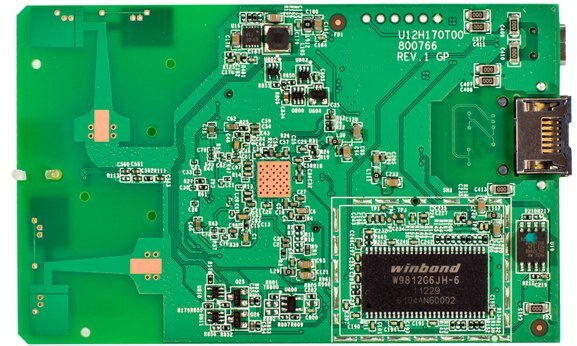 Winbond W9812G6JH-6 module is used as RAM,which capacity is 16Mbyte. All the basic logic is stored on the chip Realtek RTL8196C. We’ve considered the hardware, now let’s move on to the software. The firmware version change is performed with the help of “Firmware upgrade” item on the “Maintenance” menu group. Updating is possible in manual or semi-automatic mode which requires the connection to the Internet. We made up our minds to update the firmware manually. To achieve this goal we downloaded the file with the new software version from the official site and uploaded it to our device. The entire updating process takes not more than three minutes and no special user’s qualification is needed. Now we’ll look into the web-interface functions. 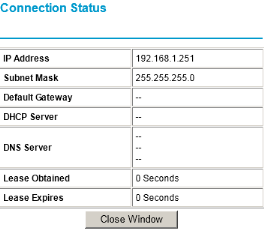 Without access to a wireless network NETGEAR WNCE3001 has an IP address 192.168.1.251 which is necessary to be connected via any current browser for an initial setup. 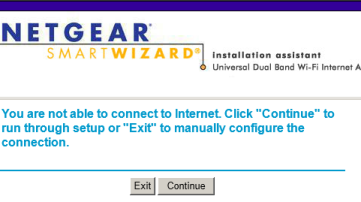 If you click the button “Continue”, you will launch the network connection wizard. 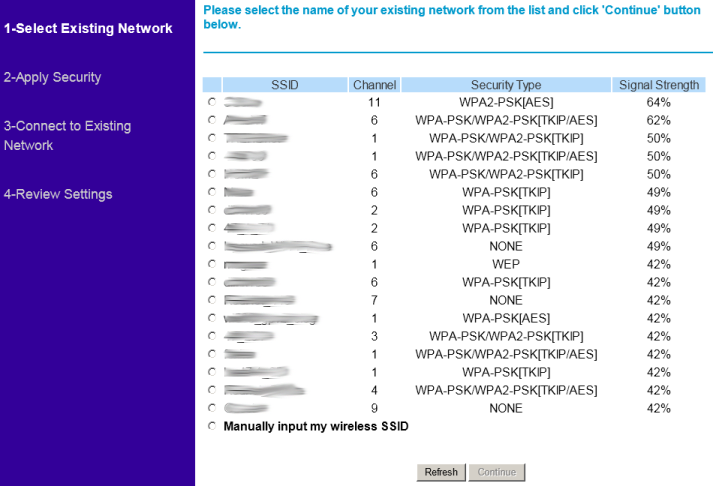 Provided the existing wireless net doesn’t perform broadcasting of its SSID, you can still connect to it by manual input of its name. Besides using the wizard it is also possible to set everything up manually with the help of the web-interface available in five languages: Russian, English, German, French and Italian. In every section there is a detailed help. Let’s have a look at the left menu items. 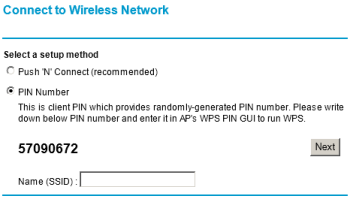 Via the item WPS a simplified connection of WNCE3001 to available wireless networks is performed. The “Setup Wizard” item launches the procedure of connection to an existing network, we have already seen it before. 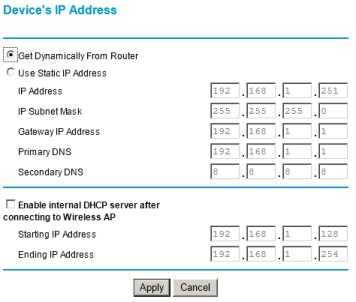 NETGEAR WNCE3001 can have static IP parameters or get them from DHCP server, the corresponding setting is realized in the “IP Address Setup” item. 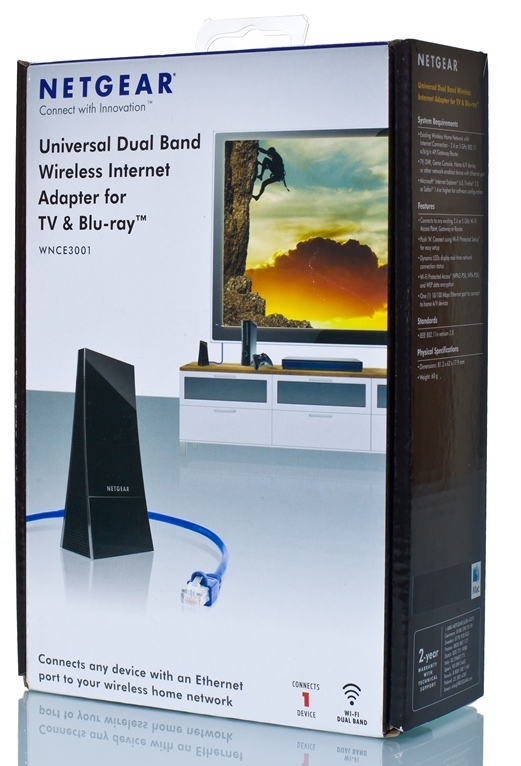 You can get the information about wired or wireless connection and the firmware versions used with the help of the “Device status” item. 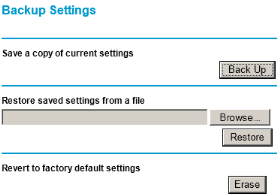 Users’ settings administration is performed in the “Backup settings” item, and via the “Firmware upgrade” item you can update the firmware. The advanced wireless settings are available in the “Wireless Settings” item. The last two menu items “Knowledge Base” and “Documentation” of the “Web Support” group redirect the user to the corresponding sections on the vendor site. 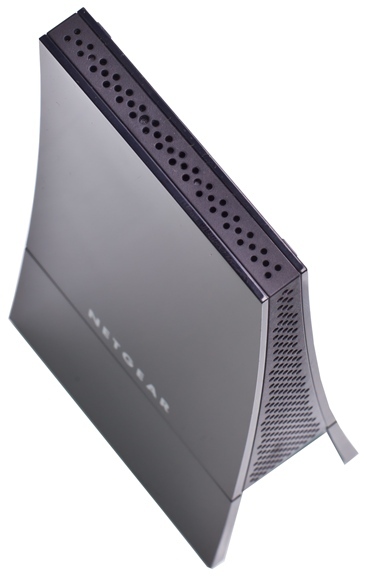 That brings us to the end of the NETGEAR WNCE3001 network adapter web-interface review. We must admit being a bit confused by the device disability to work as an access point or a repeater. The addition of such functions doesn’t seem to mean significant rise in price of the solution. By default the access to the command line is missing, but it can be switched on by a standard for NETGEAR wireless equipment method. Though WNCE3001 is a device for home usage, we still think we are to introduce all the functions of this interface to the reader. Having switched on the access you can perform the connection via any telnet client, login and password are not needed. We consider such an engineering entrance to be a serious vulnerability of the device security. The BusyBox library use is thought standard for such sort of devices. With the help of the command ps let’s see what processes are running at the moment. Let’s also find out the contents of the catalogue /bin, as the directories /sbin, /usr/bin and /usr/sbin are missing. Via the utility routerinfo from the catalogue /bin the administrator can get some brief information about the device used. A part of this information is also available through the command version. Moreover there is an nvram utility in the catalogue /bin, but unfortunately it doesn’t work. To learn the uptime of WNCE3001 is feasible via the utility /bin/uptime or by reading the file /proc/uptime. The file /proc/loadavg displays the information about the average load of the device. Now let’s go to the catalogue /proc and see what files are located here. The information about CPU and memory you can get from the files cpuinfo and meminfo. Our brief review of the command line interface is over, now we are turning to the testing section. Our first traditional test is to determine the device booting time under which we mean the time interval between switching the power on and receiving the first echo reply via ICMP. 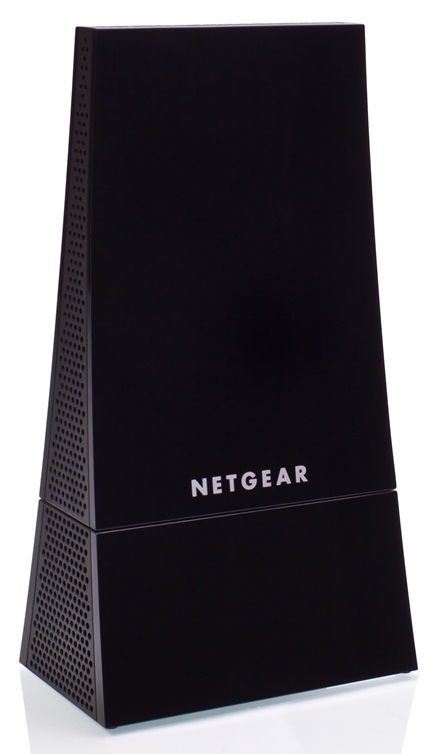 NETGEAR WNCE3001 boots within 84 seconds. We consider it a quite long period of time, though pretty acceptable. Our second test was the device security check for which we used the Positive Technologies XSpider 7.7 (Demo build 3100) scanner of network security. All in all we detected three open ports: TCP-23 (Telnet), UDP-53 (DNS) and TCP-80 (HTTP). The most exciting findings are shown below. 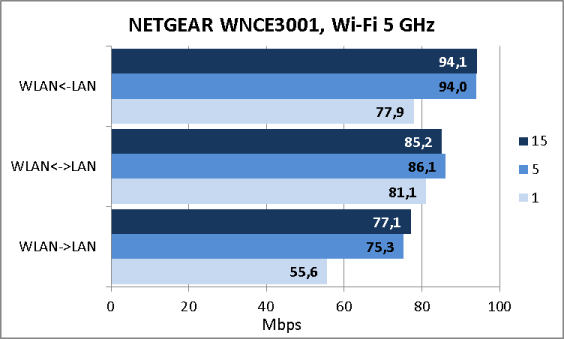 Now let’s move to the wireless network adapter NETGEAR WNCE3001 performance testing. Since the wired interface supports the maximum speed of one-way data transmission no more than 100 Mbit/s, all the “wireless” speeds will not exceed this value. 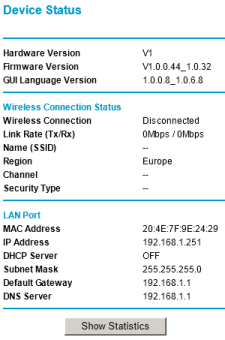 We connected the device to the ASUS RT-N66U wireless router that we have already mentioned. For testing the utility JPerf 2.0.2. was used. The measurements included one, five and fifteen simultaneous TCP sessions. The results of both frequency ranges are displayed on the diagrams below. We can’t say the received speeds are outstanding but we suppose that those will be enough to connect a TV-set or any other similar devices to the existing 802.11n wireless network. This leads us to the end of the testing section. Let’s make conclusions. 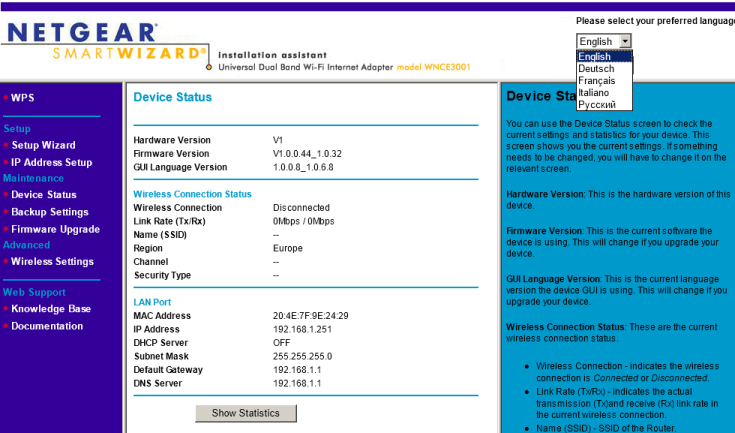 The tested NETGEAR WNCE3001 wireless client made us confused. On the one hand, it is a beautiful and stylish device for home use for a fair price, but on the other hand it is not capable of using all the speed advantages of the 802.11n wireless standard and the presence of security shortcomings makes it very “home”. The strong points of WNCE3001 are listed below. Dual frequency range (2.4 and 5 GHz) support. But we can’t help mentioning the detected drawbacks as well. The wired port is only 100Mbps. The hidden command line access via telnet without any password. 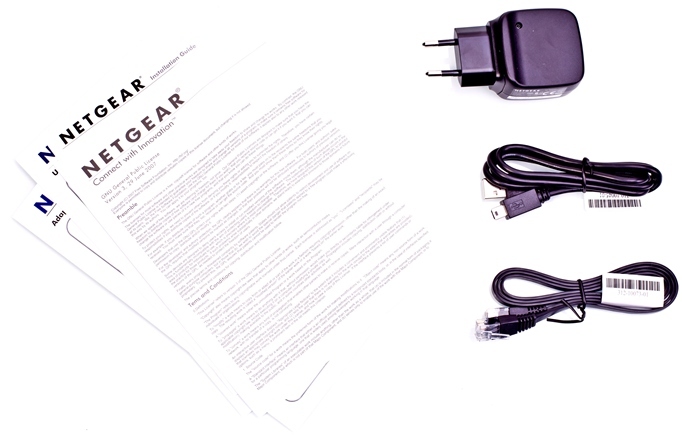 At the moment of writing the article the average price of wireless adapter NETGEAR WNCE3001 in on-line shops of Moscow was 2000 rubles.